I believe that polls and bets are to entertain people. Personally, I do not believe in them but I enjoy reading their results and learning the odds. I say this because a few days ago the social networks and various websites carried out a poll to know the public preference about the next possible opponent for WBA super champion, Floyd Mayweather Jr. The main one to call it someway was published in the personal account of the boxing star, Mayweather Jr. The possible opponents were former champion Amir Khan and the regular WBA champion, René Marcos Maidana. 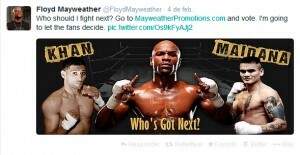 There, fans voted and according to the results given, Khan beat the Argentine. However, in other websites, the result was completely different, and Maidana took the lead. That’s when I wonder if a poll can really determine what will happen. Is the result accurate? When we find that the same person can participate several times without restriction. I don’t want to say this that these polls are manipulated, but are they useful? I think they are good for advertising, to get on the crest of the news wave. You get mentions, you are the comment of the day and everyone is talking about you. For this reason I believe that the real winner of the next contender for Mayweather Jr.’s next opponent poll was Maidana. Not to face him, but because everyone is talking about him. Even Khan does. That is the only thing that in my opinion, pools like this are good for. I do not think that a super champion fights with someone just because the public say so. There are other important things in the negotiation and decision. Everyone knows that. The idea was good, a poll proposed by Mayweather’s team brought his opponent subject to life mentioning two names, and more than one bid to fight himself.